While in town, I picked up a 2-ton floor jack on sale for $25, a replacement fire extinguisher for the trailer ( the 25-year-old one registered zero on the pressure gauge), a metal file, an abrasive sponge, and some fine grit wet/dry sandpaper. But let me describe how I got to this point, with the trailer wheel up and hub off. I didn’t want to try to hoist the affected wheel with the crappy scissors jack again, so I figured I’d press the F-250’s jack into service. That didn’t turn out as easy as it should be. The Ford’s jack and handle parts are stored in a vinyl case on the floor behind the passenger seat. Both are held in place by plastic-handled threaded fasteners. The thumbwheel fastener holding the bottle jack refused to turn, so I used channel locks to force it. That merely spun the thumbwheel without actually turning the needed screw it was attached to. So I pried the thumbwheel off with a screwdriver and got at the allen head bolt directly. It released the clamp holding the jack. Good. The handle parts and lug wrench are wrapped in a vinyl case held to the floor by a large plastic wingnut. Unscrew the wingnut, and the case should be released. Well, not today. I had to borrow Mike’s handle from his Ford E-150 and use it to operate my Ford’s jack. No time to mess with my handle right now. So I lifted the trailer wheel, pulled the hub, and looked the wheel spindle over carefully. Ohhhhh. The spindle is badly gouged up by all those loose bearing parts spinning around under load. Not sure if can be saved, and these aren’t bolt-on axle stubs. Damage the spindle, and the entire axle must be replaced. I headed for town with the hub at this point, and got the file and other abrasives. They would be needed because all those gouges actually raised metal where the bearing rests, and would make it very unhealthy for the new bearing, assuming I could drive it on at all. When I got back, I took a chisel to the Ford’s plastic wingnut and split it, and the jack handle parts were released. I can just imagine getting a flat one rainy night and not being able to get at the jack and lug wrench. I gave Mike his handle back, and replaced the F-250’s jack with the new 2-ton floor jack. Surprisingly, it’s just barely powerful enough, but it does do the job. I wiped a ton of grease off the spindle and took a better look. This just gets better and better! All the chaos in there not only gouged the spindle, but wiped metal down off the bearing stop shoulders to form interesting new folded metal surfaces which will prevent the new bearing from going on all the way. To carry its load, the bearing relies on finely machined surfaces to support it, and those surfaces are no more. Trying to fake things back into shape with a hand file is a rather ridiculous thought. But, that’s just what I did. I have no idea how well this will work, or whether it will work at all. My current action plan is to piece things back together (assuming that the repair place can extract the old races and locate new bearings), and at the end of my stay here, replace the two remaining old bearing sets. I’ll then have all new wheel bearings, and I’ll have to monitor the heck out of the running temperatures of this one hand-carved spindle. I might have to reduce my stages to 100 miles instead of the planned 250-mile stages. I might be forced to replace at least one axle on-route. 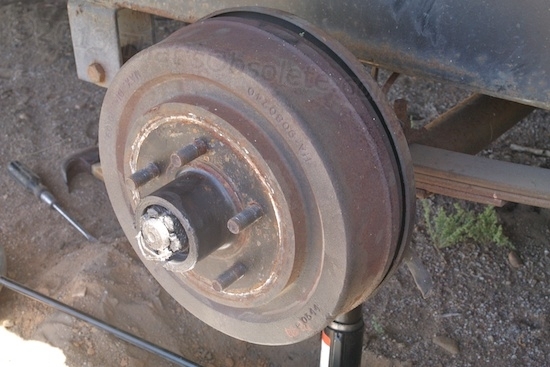 Heck, I might choose to replace at least one axle here in Wickenburg, or up in Prescott. Will I get back to Illinois? Yes, definitely. It’s just a question of money spent, and time lost. It’s an old trailer, and who knows what it’s true usage history is? Are we having fun yet? Well yes, actually. For some reason, I’m not particularly worried. I normally would be, since I didn’t plan on major problems with the running gear under the trailer. But things have a way of working out. Adapt and improvise. That’s not an alluring mode of operation on a 2,000-mile trip, but once these problems are sorted out, the crises will taper off. In the meantime, I plan to enjoy the ride. The other campers here are leaving tomorrow morning for Prescott, and will let me know where they are so I can join them once I’m up and running again. They offered to stay if I felt stuck in a no-win situation here, but I’m confident that I’ll be able to iron this out in one fashion or another. Once I’m done with Wickenburg (which is an interesting town), I’ll be proceeding to higher altitudes. Updates on Monday or Tuesday!